For three years in a row, Huck's won the Covey Award for the #1 "BEST BURGERS." Thank you to everyone who voted Huck's as the #1 Burger on the Coast! 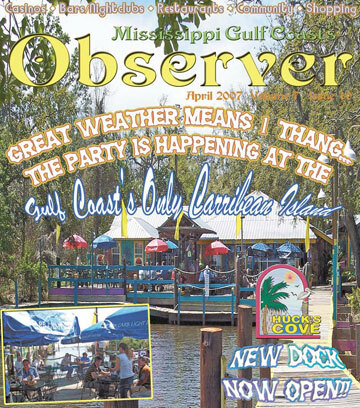 Welcome to Huck's Cove ~ A funky, friendly watering hole and grill located at the mouth of the Mary Walker Bayou and the West Pascagoula River. Specializing in great hamburgers, our tropical atmosphere is the place to be. We are all "no smoking" indoors but have a large deck area with outdoors heaters (if needed). This is the place to relax in a tropical and toasty waterfront with easy access either by auto or boat with plenty of parking ~ for both! Check out the entertainment schedule on the Tunes & Events page. Come out to Huck's ~ Gautier's tropical waterfront paradise ~ and enjoy the friendly Caribbean atmosphere, terrific food and Southern hospitality!! Oh! 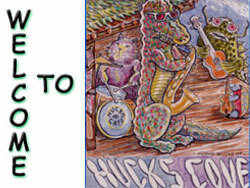 Click on The Legend of Huck for the true, folklore of Huck!